I got there early, parked in Shariff family drive way and decided to wait and catch up on my phone calls. 11 year old boy Zayd Shariff came out and went back into the house. After finishing my call, I came out of the HUNGER VAN, Sadiq, Farina and Zayd greeted me with a big smile on their faces. ” Are the volunteers here”, I asked, “yes they are upstairs waiting”, Farina replied and yelled “guys HUNGER VAN is here go help unload the supplies for the HUNGER RUN”. Zaina and her friends from West Windsor high in New Jersey came out and helped unload the supplies to prepare meals for the homeless. In 2011, Muslims Against Hunger Project started a mobile soup kitchen program known as HUNGER VAN which brings food and other basic needed items to the homeless and needy in the street. Volunteers gather in the places of their choice like homes, faith institutions, schools, community centers, parks etc. and prepare meals and deliver with the HUNGER VAN to the needy in the streets. My vision was to start any kind of event in our life with a Good Deed by making food for the people who need it, more than our friends who are part of the events like birthday parties, wedding etc. Zaina on her 15th birthday decided to follow the new trend in birthday parties. 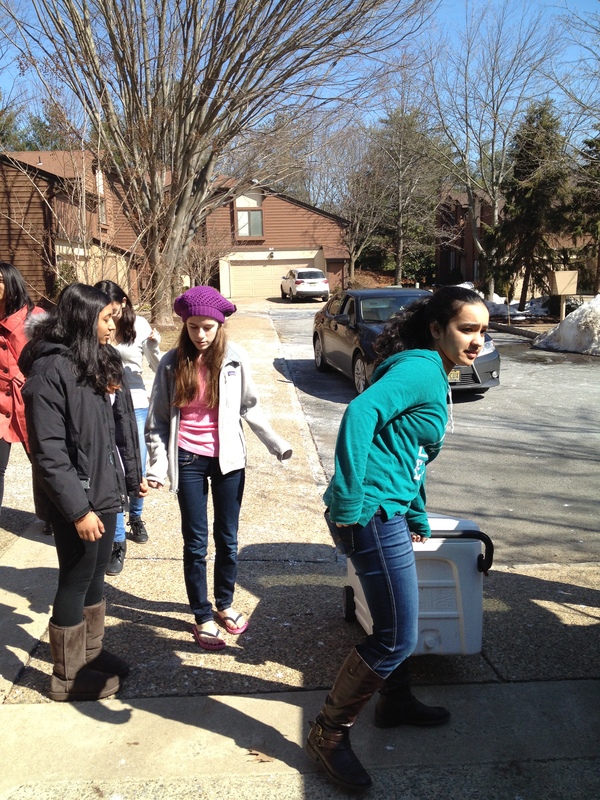 15 of Zaina’s volunteer friends from freshman class of West Windsor high in New Jersey made 150 meals to go. Zaina, her 11 year old brother Zayd , dad Sadiq and mom Farina followed the HUNGER VAN to Newark Penn station to distribute the meals. Click the link below to see Zaina and her friends in action. A hot meal usually consists of rice, vegetables, and a savory lentil or bean dish, along with bread, a banana or other serving of fruit, and water or juice. HUNGER VAN project transports the meals from the food prep location to the feeding location, where volunteers set up tables with heated serving trays. Clients are served cafeteria-style.The other meal option includes a sandwich and a salad. The popular “Honey-B” sandwich features peanut butter, honey, banana slices, and cinnamon on whole wheat bread. The ccompanying “Chickaroo” salad is really a meal in itself. It contains chickpeas, mango or other seasonal fruit, raisins, sunﬂower seeds, lettuce, tomatoes, and olives, tossed with olive oil and a south Asian masala spice mix. Volunteers place the sandwiches in bags and ﬁll 8-ounce serving cups with the “Chickaroo” salad, and put them in individual bags along with a banana and a bottle of water. Once the food preparation is complete, volunteers clean up the preparation area, re-load the HUNGER VAN, and then travel to a location where hungry and homeless people congregate but that is not serviced by a nearby soup kitchen. There they set up their tables and serve or hand out the meals. In some locations, HUNGER VAN volunteers have become such a consistent presence that the guests arrive and begin lining up well before HV even gets there.